You’ve probably heard of antioxidants, and you also probably understand that they’re beneficial for your health. But do you know why we need antioxidants? To put it simply, antioxidants are molecules that prevent oxidation. So, what is oxidation? Well, if this is your first time hearing this, it may sound more like the plot of a bad action movie, than a process that is ongoing in your body 24/7. If left unchecked, as in an absence of antioxidants designed to combat the free radicals, this can cause a chain-reaction and trail of cellular death and destruction. Which actually does sound like the plot of a bad movie. Except this carnage isn’t happening at a theatre near you; it’s happening in your body even as you read this. So, now that we got that out of the way, and you completely understand why we need more antioxidants, let’s find some great sources of antioxidants. So your body can more easily combat those pesky free radicals. There are numerous types of antioxidants. Some are generalists, like Vitamin C, lycopene, and all the carotenoids. While some, like superoxide dismutase, are considered specialists. But we’re not going to worry too much about the details, and instead focus on getting more of them in general into your diet. Getting some of these into your diet may be a challenge, while others will be pretty easy. Cinnamon can easily be added to smoothies, coffee, and other drinks, or sprinkled on top of your morning oatmeal or granola and yogurt. 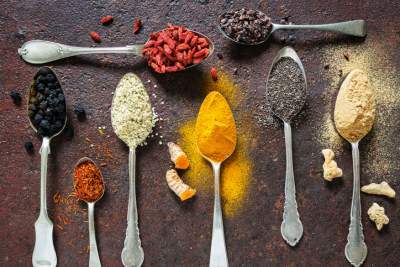 Turmeric, one of our favorite superfoods, can be added to most cooked dishes, soups, and stews without altering the flavor very much. Fresh ginger can be added to black or herbal teas for a healthy and delicious drink. You can use basil and oregano in all Italian recipes and even many that aren’t. And parsley is extremely versatile, and not just for decoration at restaurants. You may notice a pattern here, as half of this list is made up of berries. Berries are some of the healthiest foods you can eat. And when it comes to berries, or foods in general, look for those with really deep, dark colors. Because all those colors come from nutrients; the darker the color, the more nutrients. Also, the different colors represent different nutrients. Think about beta-Carotene – it’s an orange or red pigment responsible for the orange in carrots, or the red in red peppers. Which means if you want to get more variety in your diet, aim for more colors when strolling down the produce aisle at your grocery store. The purpose and power of antioxidants cannot be overstated. If you want a way to increase your lifespan and fight the effects of age-related decline, getting more antioxidants into your diet is essential. You’re only as healthy as the health of your cells. If you allow free radicals to run amok in your body at the cellular level, you won’t be healthy at any level. Which makes getting more of these super-healthful food and herbs an absolute must. Antioxidants equip your body to fight disease and inflammation, which is kind of like the foundation that disease grows from. A body that’s in a state of chronic inflammation is a body that will likely succumb to disease. If you’re looking for a way to slow the aging process, ward off disease, reduce the inflammation that contributes to disease, then you want to get more antioxidants into your body. And the way you do that is entirely through the foods you eat. Make better food choices, have better health. Know more about Dr. Raju Mantena.